Below is an article authored by a Senior Litigation Graphics Consultant at A2L Consulting. It is set for publication in PLI's Trial by Jury book. I think it does a great job of introducing the challenge of balancing color choice and culture in trial graphics. It is long established that the use of visuals and technology in the courtroom increases understanding and retention. There are many attorneys across the country who will not even consider going to trial without being armed with creative and intuitive demonstrative exhibits to persuade and educate the jury. Color is a fundamental component of creating and developing trial graphics. Many litigators, however, still use conventional color schemes in their demonstratives. Their reluctance to change is likely because at some point the conventional wisdom became using a blue background with yellow text. Although this color scheme does work, it is no longer enough. Like an antibiotic, if it is overused, it loses its effectiveness. Similarly, this color scheme has lost its impact. As jury pools diversify, and as jurors become more sophisticated, they expect more from us. In turn, we need to become more creative if we intend to persuade our audience. We need to make our graphics relevant to those whom we are trying to persuade. We must truly consider our audience, who they are, where they live, and the environmental and cultural factors that influence their behavior, attitudes, and perceptions. Color is powerful. Studies show that color can evoke certain emotional responses: it can increase learning, grab our attention, and increase perception and focus. The right color choice, used in the right way, can influence and tilt the case in your favor. Many label Edward Tufte as the “Galileo of Graphics” and the “Leonardo da Vinci of Data.” His writings on graphics and presenting are among—if not the—most prominent of our day in regard to communicating visually to an audience. While his works do not directly relate to courtroom presentation, his ideas and theory of how to appeal to an audience are highly regarded; the underlying theme of his ideas is directly applicable to litigation presentations. According to Tufte, “The most important rule of speaking is to respect your audience.” This is certainly true when addressing a jury. Tufte argues that advocates should communicate with an audience in a clear and organized way: “Presentations largely stand or fall on the quality, relevance, and integrity of the content.” Organizing a case’s information and specifics in a clear way is not always an easy task. Furthermore, advocates also face the challenge of communicating in a way that will entice and intrigue our audience so as to keep their attention. There is a limited amount of time that we have the undivided attention of the jurors to present the facts. We need to use that time wisely and in a way that will keep the attention of our audience. Jurors today have high expectations when walking into a courtroom. Despite a jury’s expectation of technology and graphics to keep their attention, cluttering the screen with colorful—but ultimately not meaningful—graphics will likely alienate the jury. Whether verbal or visual, useless information is more likely to disengage the audience than it is to draw them in. In fact, too much information can detract from the message at hand. Once you have lost the attention of the jury, it is difficult to regain it; vital information is lost. Tufte advocates a direct presentation where the visuals supplement, rather than dominate, the presentation. Bright and even animated words on the page are not automatically relevant. Rather, a presentation is persuasive when it contains succinct and understandable arguments backed by the demonstratives that accompany the presentation. Thus, the colors and content of the visuals that you choose to represent your themes and case facts are an important factor in the development of your graphic exhibits. The use of technology and demonstratives in the courtroom is not only an integral part of a litigator’s arsenal of support, but also expected by most jurors. The modern fact finder expects much from the trial team when they walk into the jury box. We can attribute this in part to the ability of demonstratives to help the jurors understand the specifics of the case. This is also due to the ever growing use of technology in today’s television shows and their portrayal of the legal process. Television shows like Bones, C.S.I., and Law & Order give prospective jurors the impression that the intuitive officer easily solves a case with fancy technology and insightful comments. On television, viewers watch attorneys recreate the scene with computer images and simulations at trial. While these shows may depict more of the criminal legal process than the civil side of litigation, the expectation of drama and glamour in the courtroom remains. Thus, the legal profession faces the challenge of reaching its audience—the fact finders—in a way that will meet their expectations, hold their attention, and speak to the person as an individual. Jurors have high expectations. The use of graphics and technology has evolved such that we need to look for new and innovative ways to reach jurors. We know that repetition via auditory and visual techniques increases retention and comprehension. We are both visual and auditory learners. Studies show that jurors retain more information when they see and hear the evidence. One particularly well-known study—the Weiss-McGrath report—found "a one-hundred percent increase in juror retention of visual over oral presentations and a six-hundred percent increase in juror retention of combined visual and oral presentations over oral presentations alone." The report also showed that subjects who only heard information had a seventy percent retention rate after three hours and only a ten percent retention rate after 72 hours. Likewise, in subjects who only saw information there was a 72 percent retention rate after three hours and a twenty percent retention rate after 72 hours. However, when you compare these results to the results of the subjects who both saw and heard the same information, there was an 85 percent retention rate after three hours and a 65 retention rate after 72 hours. Retention is good. We want our jurors to remember our argument, and deliberate over our words. We also want to be able to reach the fact finder on a deeper subconscious level that melds with their understanding and perceptions in a way that persuades them to reach the conclusion we are seeking through our presentation. Color is an effective avenue for achieving this level of understanding. Regardless to whom you are presenting—be it a judge, jury, or an arbitration panel—it is important to have an understanding of the characteristics of a persuasive and meaningful argument. Consider the audience. Step into their shoes. Evaluate how they will perceive you, your case, your theme, and your graphics. According to Waites, when attempting to reach our audience we should consider their attitudes and life experiences, and how that will affect their outlook on specific issues of the case, personality traits, what their values and belief systems are, and location of the trial: what demographic influences might there be. Research shows that messages that are the most persuasive and powerfully compelling are those already “reflected in a juror’s long-term reference memory.” Effective courtroom persuasion relies on the attorney’s ability to reach the jurors and to activate the juror’s long term memory by association and repetition. Whether we want them to or not, jurors bring life experiences, personal values, and beliefs into the courtroom. If the trial attorney is able to associate the new information—or the information they are presenting at trial to information that is stored in the juror’s long term memory and belief system—this will facilitate understanding and the ability to process and store new data. The modern attorney uses visual aids such as demonstratives and technology in this process. Jurors will rely on their own life experiences and preexisting beliefs in evaluating evidence. Thus, themes reflected in demonstratives that invoke or conform to the juror’s value system and long term memory have a better chance of speaking to the jury. The integration of the right color into these demonstratives can be a valuable means of activating the juror’s long term memory by using color as a form of association to invoke certain feelings towards their argument. Let us look at this from another perspective: What are the types of things that people retain in their long-term memory? Typically, people incorporate certain sounds, smells, and colors into their perceptions and memories. Reminiscences of a certain song on the radio, the smell of fresh baking bread, and even the color of your grandmother’s table cloth can influence how we perceive the world around us. These recollections shape our long term memory and call to mind certain feelings that influence how we form opinions on new information, or data presented to us. Different cultures associate different feelings with color. Again, color is powerful. It evokes emotions and influences us at every level. Thus, attorneys should consider the cultural influence of color when creating demonstratives that the attorneys intend to speak to and influence the jury. The themes used at trial to tell the story that best tap into jurors beliefs or life experiences are themes that the jurors can relate to and retain. Where the audience may have preconceived notions about a given topic, the challenge facing counsel is to find a way to persuade the audience to reconcile their longstanding beliefs about the issue at hand. The use of color to access the audience’s long term reference memory is an invaluable tool in relating to people, appealing to their senses, and in turn persuading them to have a more favorable opinion of your case. This can ultimately affect the outcome of the trial in your favor. With trial exhibits, color predominantly reinforces themes and a story that fosters acceptance by the decision maker. However, there is deeper meaning to our color choices. Color and perception is such a large part of every culture, that it is imperative for the attorney to understand their audience. It is undisputed that color can be instrumental in persuading fact finders. Having a sense of cultural consideration can aid the presenter in making wise and insightful color choices when developing case themes and graphics. Choosing colors that appeal to a particular group in places where certain socio-cultural groups dominate can give a psychological edge to the presenter in reaching and appealing to their audience. Color can subtly influence our associations, and the use of color is a helpful aid in generating interest in your story. Sir Isaac Newton discovered that pure white light separates into all visible colors when it passes through a prism. In a series of experiments conducted between 1666 and 1672, Newton first recognized the idea of the rainbow, which is comprised of separate components of red, orange, yellow, green, blue, and violet. Johann Wolfgang von Goethe, however, realized that perception also shapes the sensations of color reaching our brain. Although Goethe’s ideas on color were never widely embraced by the scientific community, they did greatly influence the art world. Artists use color to express emotion a theme or a feeling. They use color to engage the viewer and draw them into their scene. That is what we as attorneys must do. We need to engage our audience, and draw them into our story. By using colors that appeal to their psyche and belief system we are able to increase our chances of association and “win” over our audience. Edward Tufte also recognizes the benefits of using color in an appropriate manner. He believes there is an art to putting color in the right place. Tufte outlines the fundamental uses of color in information design: to label, to measure, to represent or imitate reality and to enliven or decorate. Used at its best, color has overwhelming informational benefits. It is this aspect of color that we need to use to our advantage. The question then becomes, what are the informational benefits of color, and what is the best strategic use of color to influence our audience. We need to be able to use color in a way that gives decisive weight to the information, yet does not negatively affect the cognitive ability of the audience to digest it. Too much visual stimulation can take away from the data presented. To effectively engage our audience at this level, we need to look at the different meanings of color, how to use color, and consider cultural and geographical location. Interpretation and color meaning varies by country and culture; people of various cultures perceive and respond to colors differently. For example, western cultures generally break down color into temperatures: Cool colors such as blue, purple, and green invoke feelings of calm, sadness, or indifference. Blue is often seen as trustworthy, dependable and committed. It affects us mentally by invoking feelings such as a calming, cooling, or sedative effect cooling, and may also aid intuition. Warm colors are in the red area of the color spectrum: Red, orange, and yellow. These colors may evoke emotions ranging from warmth and comfort to feelings of anger and hostility. 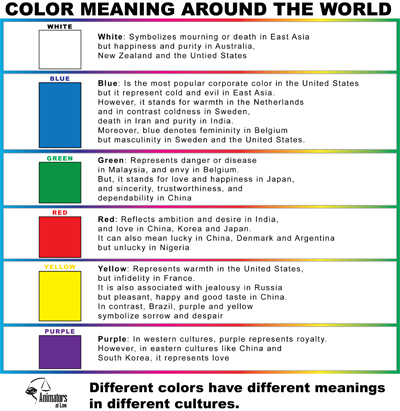 On a deeper level, individual colors have different meanings in different parts of the world. If we explore these cultural interpretations of color, it can help us to identify with our audience and develop effective demonstratives to persuade our audience at a deeper level through association and perception. White: Symbolizes mourning or death in East Asia, but happiness and purity in Australia, New Zealand and the United States.Blue: Is the most popular corporate color in the United States, but it represents cold and evil in East Asia. However, it stands for warmth in the Netherlands, and in contrast coldness in Sweden, death in Iran and purity in India. Moreover, blue denotes femininity in Belgium and the Netherlands, but masculinity in Sweden in the United States.Green: Represents danger or disease in Malaysia, and envy in Belgium. But, it stands for love and happiness in Japan, and sincerity, trustworthiness, and dependability in China.Red: Reflects ambition and desire in India, and love in China, Korea and Japan. It can also mean lucky in China, Denmark and Argentina but unlucky in Nigeria.Yellow: Represents warmth in the United States, but infidelity in France. It is also associated with jealousy in Russia, but pleasant, happy, and good taste in China. In contrast, in Brazil, purple and yellow symbolize sorrow and despair.Purple: In western cultures, purple represents royalty. However, in eastern cultures like China and South Korea, it represents love. Color and courtroom graphics - where do we go from here? As the demographics of our country, and therefore our jury pool are changing, it is important that as legal professionals we look beyond the basics of color and into the meaning behind it so we can use color to effectively persuade our audience. 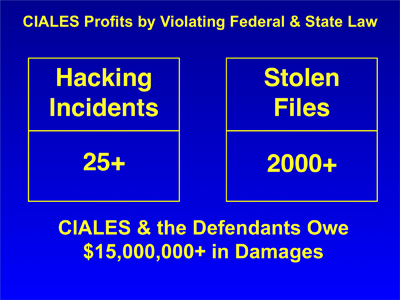 The unspoken—but generally accepted—rule of courtroom graphics is to use a standard blue background with yellow text. The conventional wisdom for applying color includes using blue backgrounds, and yellow, gray, or red to highlight, neutralize, or emphasize. While somewhat successful, the changing demographics of this country and jury pool are an important consideration lost by these conventional schemes. Accordingly, attorneys may miss the psychological and socio-cultural associations of color in the courtroom. Courtroom technology is a proven method for stimulating jurors and aiding in comprehension and retention. Attorneys generally use color to highlight a theme, emphasize a point, and to catch and hold the attention of the fact finder. This allows the litigator to hammer their point into the jury in the short time that they have the jury’s undivided attention. Color becomes important here because studies show that color psychologically affects based on individual character or personality traits. Other reasons for using color are to: Emphasize key points, highlight important information, group similar items, create a mood, provide continuity, increase reading speed, and learning. Color can also tie exhibits together and develop a theme in the case. Thus, the choice of color is not only important in selecting color combinations that effectively tell your story and highlight important facts on the exhibit or graphic, but color must also appeal to your audience. Therefore, uniform color choice or the conventional blue and yellow color “standards” used in trial exhibits and demonstratives may not always work. Color must strategically appeal to your audiences’ subconscious. Therefore, the central inquiries are whether: (1) color preferences and meaning are learned over time and result from experience; (2) are they inherent in our culture; or (3) is it a combination of both? Jurors or fact finders bring their personal beliefs and experiences with them into the courtroom, and use this to interpret and evaluate the facts as presented. Statistically, jurors will disregard ninety percent of the information received at trial, and focus on the few things that stick out in their mind. Indeed, fact finders are human and will remember best that information or evidence that coincides with their belief systems and personal experiences. This elevates the importance of demonstrative exhibits. Accordingly, attorneys must consider the cultural associations of color choices in exhibits and graphics. Since color has different meanings in different parts of the world, cultural background plays a significant role in the interpretation of color, and therefore in the ability to win over the judge, jury or panel. Different cultures in different parts of the country may have a stronger environmental influence or make up a majority of the population. For example, a jury in South Florida is likely to have a higher percentage of jurors with a South American or Latin American heritage as opposed to a jury in the Midwest. The makeup in large states can also vary: a jury pool in northern California is likely to have a higher Asian influence than a jury pool from southern California, which has a predominant Latin influence. As such, these jurors are likely to respond differently to different colors based on their cultural heritage and beliefs. An attorney going to trial in these locations should consider what colors will best influence and persuade, or worse abandon their audience. If we consider the venue when deciding when or how much technology to use, and whether or not to give local counsel first chair because of jury perception, we should also consider these same concepts of the venue and jury pool when creating demonstratives, i.e., the color choices based on cultural and environmental preferences. Marketers use the theory of cultural preferences and response to color; why should it be different in the courtroom? There is a lesson to be learned here for trial lawyers. Whether you are a marketer using the internet or advertisements to sell your product or a litigator convincing a jury of your side of the facts, the goal is persuasion. The strategic use of color can be used appeal to your audience and influence. Our culture, in general, is visually attuned: media imagery plays a significant role in appealing to persons of all cultural backgrounds. As lawyers we should learn from the success of marketers and television on how people learn and retain information. As the demographics of our country change, we too must adapt our approach to presenting our case and the methods of persuasion. Gone are the days where attorneys hesitate to use technology in the courtroom for fear of being perceived as over-doing it or overbearing. The modern juror expects to see some type of technology in the courtroom. Indeed, the evolution of presenting in the courtroom has gone through many stages. There was a time when attorneys would pass around a piece of paper as evidence for the jury to review. At one point it was considered “high tech” to use a slideshow of photos or an overhead projector to show exhibits, or even a VCR to show a video. Then, as the digital era dawned, personal computers became common place and portable. Through this, it has become widely accepted that visual aids and demonstratives help attorneys to tell their story and to facilitate the retention of more information. Now, attorneys use Power Point presentations, graphics, animations, and databases of exhibits and videos. The use of courtroom technology was once a novel idea, and it is now not only common, audiences expect it. The same is true of color. The “standard” color schemes we once believed would win over any jury are ineffective. In short, juries have seen it all before, and the modern juror expects more. They are technologically and culturally sophisticated and look for the “wow” factor. We must use our knowledge and experience as a platform to move forward. Effective use of color is different by demographic, region, and jury. To capture the attention of the modern juror, we need to look beyond the basics of what has worked in the past towards what will influence our new audience now and in the future. As the demographics and cultural backgrounds of our jury pool changes, we must also adapt by understanding how to appeal to their values, beliefs, and cultural influences. Marketers are using the idea of cultural considerations and cultural meanings of color in their marketing techniques. As an industry we should start noticing this concept. The jury pool is changing both culturally, and generationally. As we stand in front of the jury box, it is highly likely that the jurors staring back at us are tech, web, and culturally savvy, and are not easily influenced. We need to find a way to bridge the gap, and connect to our audience. Color is powerful when communicating with our audience. Color can increase learning and evoke an emotional response. The advocate must use the right color for the right audience. We should rethink past theories for choosing color in a trial presentation. Is a standard blue background still the best approach or, have shifting cultural demographics and changing value systems surpassed it. The ultimate goal is appealing to and persuading our audience. We, as the legal profession must keep pace with our audience and renew our approach to appeal to the modern jury.